“Christmas in New York.” Has a nice ring to it, wouldn’t you agree? You can close your eyes and envision a winter wonderland in the big city. The decorations… the city lights… the chilly air… the romantic destinations… the shopping. Yes, spending time in New York City during the holiday season can be quite wonderful and filled with cheer. And now that you’re definitely considering celebrating the holiday season in New York, this is the perfect time to visit TicketsatWork.com; check out all the terrific attractions we offer in NYC, and how members can find great savings when they visit the Big Apple for the holidays. Radio City Christmas Spectacular – This fits the must-see list, for sure. From the beloved Wooden Soldiers, to the dazzling Snow scene, to the unforgettable Living Nativity, it’s the best of the season in one spectacular experience. And we are offering over 25% off tickets! 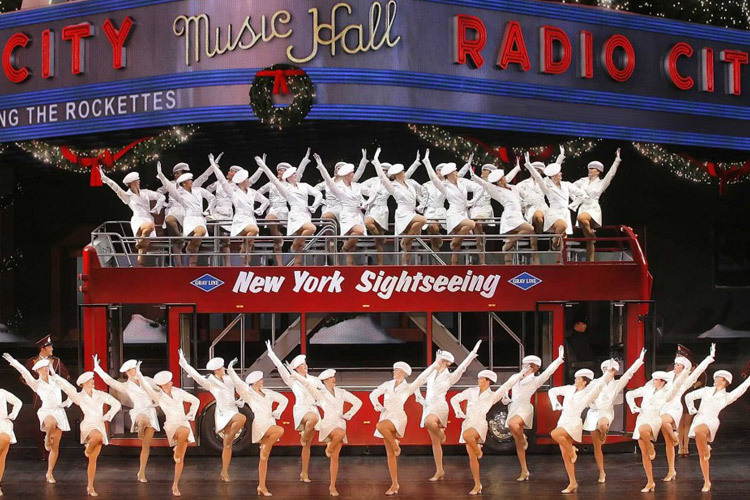 For the 90-minute show, Radio City Music Hall is decked out for the season and the Rockettes shine like never before in a breathtaking new number that transforms the stage into a glistening winter wonderland. CitySights New York Tours – If you’re planning to be in NYC for the holidays why not explore the excitement of the city from a very cool and comfortable point of view: a double-decker bus! You can save over 15% with our hop-on, hop-off bus tours. The fleet of new double-decker buses is designed with top-deck-only seating to provide you with the best possible views of New York Attractions, neighborhoods and places of interest. On our Night Tour you’ll get an amazing view of the illuminated Manhattan skyline from a special stop on the Brooklyn waterfront. Our Brooklyn Tour takes you to trendy and historic neighborhoods. New York CityPASS – Another ideal way to see the sights, we have savings up to 42% off combined attractions that make up the New York CityPASS, which is an admission booklet to 6 must-see tourist attractions in New York City. Not too shabby a list of amazing things to do in the Big Apple. Here’s a nice extra: Once you have your CityPASS booklet, skip the ticket line and head straight for the entrance. Visit the attractions in any order you wish. Books are valid for nine consecutive days, beginning with the first day of use. New York City Explorer Pass – Select between 3, 4, 5, 7 and 10 attractions packages with TicketsatWork.com and find savings up to 45% on NYC’s finest sights to see. The New York City Explorer Pass is the best choice for maximum savings and flexibility. Get access to over 50 top attractions, tours and activities all at one low price! Enjoy the flexibility of picking your own attractions when you get to New York City and take up to 30 days to use your pass. Attractions include a Hop on Hop Off bus tour, Statue of Liberty and Ellis Island, Empire State Building, Top of the Rock, The MET and many more. NYC Nightclub Experience – What would the Xmas holidays in NYC be without some after-dark fun? What we suggest is an evening spent hanging out at the VIP table in some of the best nightclubs in the world. You’ll know the meaning of the ‘city that never sleeps’ as you party in a variety of much buzzed-about hotspots around town. And we have a deal that equals no lines, no stress, just one of the best times of your life spent right in the heart of New York’s nightlife. With TicketsatWork.com you can save 25% on passes, which includes entrance fees to the clubs and three drinks (of our choice) at the VIP table. So there you have it – a few choice options from TicketsatWork.com to make your Christmas in NYC filled with lots of fun, joy and great savings!